Big butts may be good for Sir Mixalot, but a big ‘but’ can curtail your communication and have big consequences. No, I don’t mean junk-in-the-trunk kind of butts, but 'but'…you know…the word. What happens in your mind when someone sticks a big 'but,' or even a little 'but' in their sentence? You can already feel it. And as you know, when there's a battle between thought and feeling, feeling wins. Every time. Whether a big or little 'but' is in the way, our emotional response is to ignore everything that went before the 'but’ and to focus only on what comes after it. The word ‘BUT’ negates everything that precedes it. And, it's like a flashing warning signal that a really important point is coming up. You can try to hide it…but…. ‘However’ and ‘and yet’ and ‘though’ are the linguistic skinny jeans for buts. Get your 'but' out of the way and use ‘and’ instead. When I was studying improvisational comedy back in my late teens, the concept of “yes, and” is one of its cornerstone rules, which suggests that person #2 should accept what person #1 has stated, "Yes," and then expand on that line of thinking with "and." The "yes" encourages acceptance of the contribution by others. "Hey, you look great." And you say, "Thanks, but I think my hips are still a bit jiggly." "Hey, you look great." And you say, "No I don't." OUCH. Each time you use "YES...BUT" or you completely negate what someone says with a NO you actually disrespect the other person's point of view and devalue not only their statement but themselves. 'But' immediately causes an unconscious linguistic defensiveness in the person you're communicating with. I love you…but…I need to be single right now. Let’s be honest. Just never say that. So instead, try use yes...AND. You’re incredibly qualified, but I think you’d be better suited elsewhere. You’re incredibly qualified, AND I think you’d be better suited elsewhere. I totally agree with what you’re saying, but could we discuss this one small matter. I totally agree with what you’re saying, AND could we discuss this one small matter. This is so hard but so worth it. This is so hard, AND so worth it. You could have done better BUT I know you’re going to practice more the next time. So we’re having a difficult time communicating, BUT what’s important is that we’re constantly growing. Do you see how each time 'but' is used it causes the listener's attention to be more focused on the positive, rather than what they did wrong? So what if a but slips in from time to time? The whole point of neuro-linguistic programming is that we are 100% responsible for the language that we use and how we communicate. Just as the other person we are communicating with is 100% responsible for their communication. You now have the power. You have danced in the matrix of 'buts,' just like Sir MixaLot. It’s now up to you to share your knowledge. 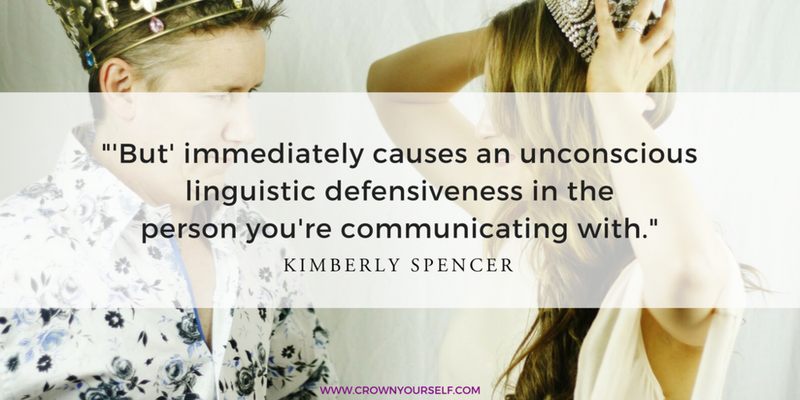 Send this to one friend with whom you want to deepen your communication. Newer PostAre Your Problems Just Hot, Stinky Air?